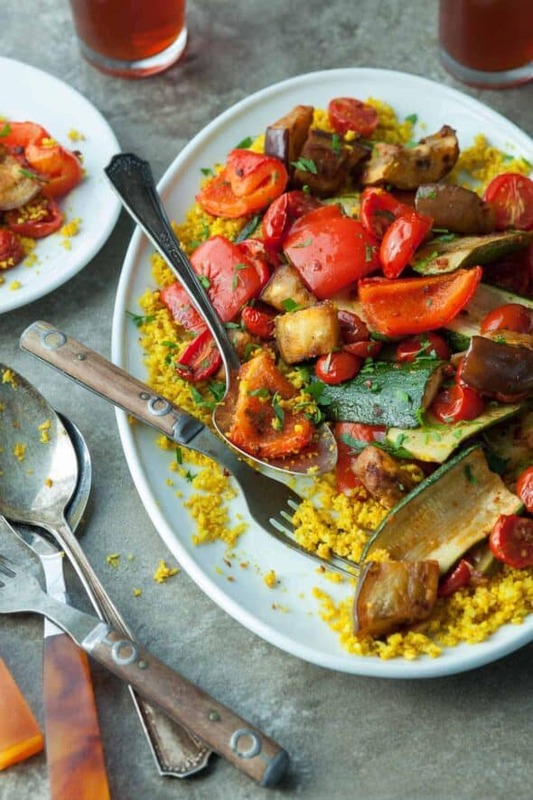 An easy oven-roasted and harissa spiced ratatouille served with cauliflower couscous. 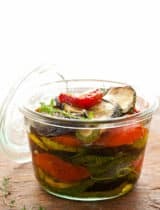 Now is the time to make ratatouille, that in-between period when summer is winding down and fall is just around the corner. Although Labor Day is the unofficial end of summer we do technically have a couple more weeks left and I’m not in a rush to bid summer goodbye quite yet. 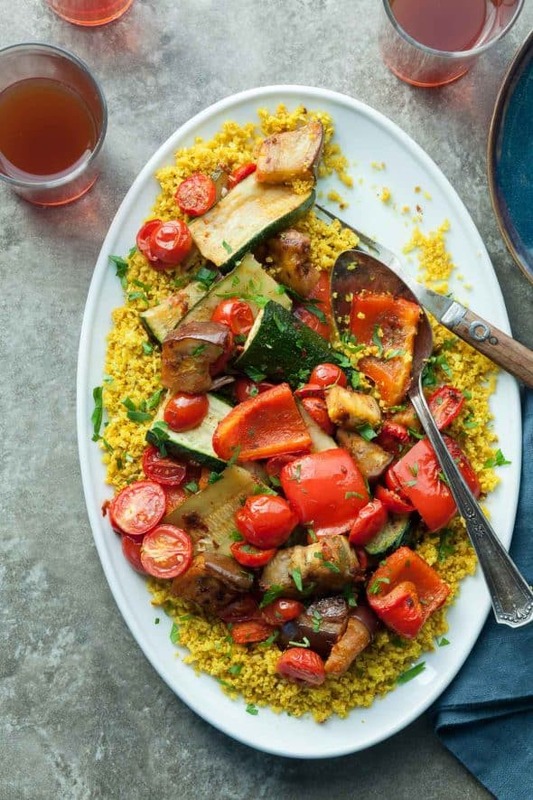 So these last days of summer and first days of fall, while tomatoes, zucchini, eggplant and peppers are still plentiful, I’ll be making ratatouille. My ratatouille is admittedly unconventional, it’s a mainly hand-off affair made in the oven with a bit of a spicy kick instead of the usual herbs. I start with most of the usual suspects: tomatoes, peppers, eggplant and zucchini, but instead of cooking them on the stove-top I let the oven do all the work for me. Roasting the vegetables brings out their natural sweetness and intensifies their flavor. 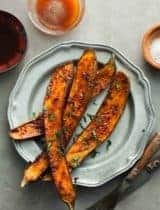 Instead of traditional thyme and bay leaves I add harissa paste for a spicy North African twist; the red chili pepper and sun-dried tomato paste is bright, bold and a wonderful compliment to the roasted vegetables. What you end up with are vegetables that are shrunken and softened and infused with lots of garlic, olive oil and spice. 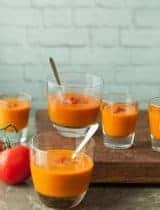 The eggplant is smooth and silky, the tomatoes sweet and juicy, the zucchini tender and creamy and the peppers soft and slightly charred at the edges. You can serve it hot or cold and the flavors only improve with an overnight stint in the fridge. I like to serve it with cauliflower couscous but you can also eat it by itself. 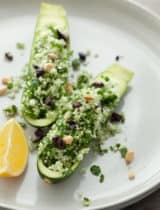 The cauliflower couscous comes together in a flash and cooks right in the oven as well so it’s really quite easy to make. 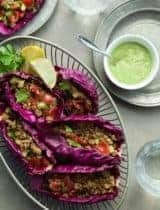 You just chop a head of cauliflower in the food processor, toss it with some oil and spices then spread it out onto a sheet pan and pop it in the oven alongside the vegetables until golden and nutty. 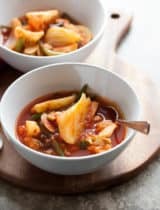 Hearty and healthy and filled with vegetables, the whole dish comes together in less than an hour, making this a great weeknight option. 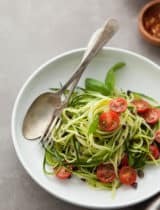 Place the zucchini, bell peppers, eggplant, garlic, salt, pepper, 1 ½ Tablespoons of the olive oil, harissa, coriander in a large bowl and toss to combine. Spread the vegetables on a baking sheet. 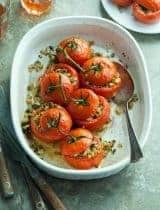 Place tomatoes with the remaining ½ Tablespoon olive oil in a separate bowl and set aside. Pulse cauliflower florets in a food processor until finely chopped (about the size of couscous). Place cauliflower in a large bowl along with the coconut oil, turmeric powder, salt and pepper and toss to coat. Spread onto a baking sheet and place in oven. Roast for 15 minutes, stir and continue to cook for another 10 minutes until light, fluffy and lightly toasted. Roast vegetables for 15 minutes, remove from oven, add halved cherry tomatoes and return to oven for another 15 minutes. 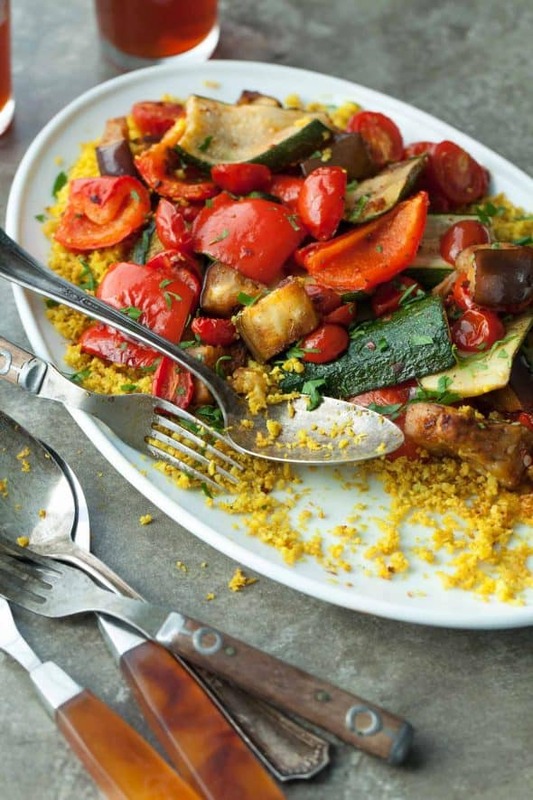 Remove from oven and serve vegetables over couscous and sprinkle with chopped parsley. This is my type of dish. I just wanted to stop by to say hi. I used to be Delishhh and then i had a family and things just got too busy so i stopped blogging for awhile and now i am back but as Carrots and Spice. I have been following you for years but i don’t comment much and just wanted to say hi. Hi Ewa, yes I remember, glad to see you blogging again!